I would rather think of Wriphe as a good book. 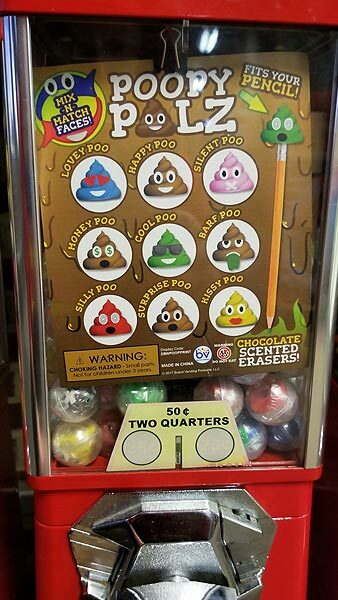 There is so much to say about this, but what I keep staring at is the fact that they're "chocolate scented." That may forever destroy my relationship with chocolate. So much to say and yet you only give us two sentences? I feel gypped! What do you want me to say? That poopy isn't anyone's pal? That Silly Poo should have been named "See a Doctor Poo"? That Silent Poo looks disturbingly like cotton candy? That no one should want mix-and-match poo faces? That from now on, I'll always think of Happy Poo when I look at chocolate soft serve ice cream? Too bad. I won't say it. I feel okay with this, and strangely satisfied. If you had three amusement park rides and I gave you three more, how many would you have? Afterwards, if I gave you seven more amusement park rides, how many would you end up with?